"Peace, as we have seen, is not an order natural to mankind: it is artificial, intricate and highly volatile. All kinds of preconditions are necessary." -- Michael Howard, "The Invention of Peace"
And here comes World War I, wrapped in World War II, wrapped in the Cold War: tremors on one of Planet Earth's human fault lines. We have enough angry, manipulable people on this planet to carry out the game plan of the political ideologues and war profiteers, who are always on the lookout for the next war, the one that's too volatile and "inevitable" to stop. As David Swanson, author of "War Is a Lie," put it: "The search for a good war is beginning to look as futile as the search for the mythical city of El Dorado. And yet that search remains our top public project." And the searchlight stops at Ukraine, full of neo-Nazis, corrupt oligarchs, nuclear reactors, an unelected government, a wrecked economy, a simmering civil war. God help us. Old animosities and ideological divisions come back to life. The United States and NATO stand off against Vladimir Putin's Russia. Thirty-one people -- maybe more -- reportedly die in a burning building in Odessa. This kind of thing could be the pretext for a world war. Sanity is up in flames. "The crisis in Ukraine is serious," Floyd Rudmin writes at Common Dreams. "At some point soon, reality needs to become the priority. No more name-calling. No more blaming. If there are any adults in the room, they need to stand up. 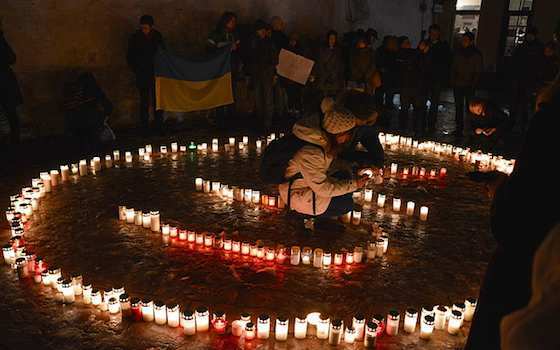 The crisis in Ukraine is going critical, and that is a fact." What if one of the adults were an elected official, specifically, the president of the United States? In an open letter, a group called Veteran Intelligence Professionals for Sanity has urged President Obama to look beyond John Kerry and Washington's neocon consensus for advice and direction on Ukraine -- as, it turns out, he ultimately did with Syria -- and "schedule a meeting, one-on-one, with President Putin as quickly as possible." There are numerous acts of geopolitical rationality and goodwill -- e.g., rescind Ukraine's invitation to join NATO -- that could avert the crisis. That's all that matters. "In 2014, on the one century anniversary of World War I, European nations are again mobilizing for war," Rudmin writes. "As in 1914, so in 2014, war is not for repelling an attack, but for loyalty to an alliance, even when some members of the alliance are belligerent. The 1914 war was supposed to be over by Christmas, but went on and on and on for years, killing 9 million people. The 2014 war, if its starts in earnest, will be over in one week, maybe less, and could kill a 100 million people depending on how many nuclear reactors break open and how many nuclear missiles are launched." He adds: "The 1914 war was called 'the war to end all wars.' The 2014 war will be that." Human civilization is walking along the edge of collapse. Endless material growth, driven by a profit-based economy, is wrecking our natural habitat, but our antiquated systems of leadership answer primarily to the destructive status quo and are unable to implement meaningful, crucial change. That same status quo is addicted not simply to fossil fuels but to a perverted, reptile-brain sense of "survival of the fittest" that requires constantly identifying, engaging and defeating an enemy. This is called war, and we prepare for it more than for anything else, including the education of our children. With the development and stupefying proliferation of nuclear weapons, war has become the fast track to annihilation -- which, of course, the world grasped during the four-plus decades of the Cold War. Lacking the will and courage to pursue nuclear (or any other kind of) disarmament, the leaders of the two sides of the arms race settled for the concept of "mutually assured destruction"--MAD -- to maintain security. Beware of our nukes! And, voila, there were no more world wars, no more direct conflagrations between superpowers: proxy wars only. And most of the casualties were Third and Fourth Worlders. In the U.S., the military-industrial complex grew fat and prosperous. But the Soviet Union, economically less able to maintain the arms race, spent itself into oblivion and collapsed in 1991. MAD was declared a success. But of course there was more going on here than a short-term competition between East and West. When the Cold War ended, peace hardly prevailed. In the U.S., there was no "peace dividend": no diversion of military spending into education, infrastructure maintenance or the social safety net. We just looked for new enemies. The military budget expanded. And the Cold War itself -- this deep, unspoken commitment to mass suicide -- merely went on hold. And now it's back, with the two sides still in command of thousands and thousands of nuclear weapons. Of the 15,000 nuclear weapons currently housed on Planet Earth, 95 percent are controlled by the U.S. and Russia, and 3,000 of those warheads are on hair-trigger alert, according to Ira Helfand, co-president of International Physicians for the Prevention of Nuclear War. The neo-Nazi nationalists who attacked the pro-Russian protesters in Odessa last week, burning their tent encampment, driving them into a building and setting that building on fire with Molotov cocktails, reputedly called their dying enemies "Colorados" (which are black and red potato beetles, the color of the ribbons symbolizing a pro-Russian political commitment). So here we have it: the full spectrum of "human nature" on display in Ukraine: from dehumanizing insult to . . . potential nuclear war. "Peace, as we have seen, is not an order natural to mankind." Reaching for our higher -- angelic -- nature is not a natural reach, but now is the time to try. "Ukraine: The War to End All Wars"